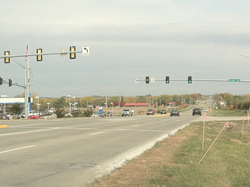 In response to local concerns, the Iowa Department of Transportation (DOT) requested a road safety audit (RSA) for the IA Highway 28 corridor through the City of Norwalk in Warren County, Iowa, from the south corporate limits of Norwalk through the IA 5 interchange in Polk County, Iowa. The audit included meeting with City staff to discuss concerns, review crash history and operational issues, observe the route under daylight and nighttime conditions, and analyze available data. This report outlines the findings and recommendations of the audit team for addressing the safety concerns and operational matters along this corridor.